Website and processes: 8 Dec 16 Peter, 5/5 Excellent "Excellent really easy website to use. " 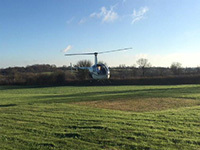 Explore the first step towards your Helicopter Licence with this unique introductory package. Get hands-on with this package, hosted by qualified commercial pilots who will have flown many aircraft in all areas of the aviation industry. As the UK's largest flight training school network, we can give a unique insight into what the industry is really like, and send you away on your first step to the Captain's seat!